The highest peak in the Kinner-Kailash range; one can admire it comfortably from a bungalow at Kalpa. Often mistaken called Kinner Kailash (which is a smaller holy pillar to north of it). It has been climbed by the I.T.B.P IN 1974 and by the IndianPara Regiment in 1978. Kapadia) in 1994. They climbed the north East Ridge from the col. The north face is the ultimate challenge on this peak. There are several high peaks in the valley. The highest peak in Himachal Pradesh. It rises to the north of Shikpi-La, from where the Satluj enters India and is formidable challenge justifying its name, abode of demon. The first ascent was made by I.T.B.P in 1971 but no details were available; this climb was always questioned. In 1991 four climbers from Delhi (Yousuf Zaheer) climbed to the top by the west ridge-wets shoulder. On the top they found an old bamboo stick, putting at rest any doubts about the 1971 ascent. One of the beautiful unclimbed peaks of the middle Himalaya. It rises above Nichar on the road to Kinnaur. It will be a good challenge and represents many peaks up to these heights in the area, totally free of any restrictions. The area has hard rock faces and easy approaches. A veritable for climbers, if height is not major consideration. The highest of a group of five, this peak forms a path to heaven, followed by Pandavas, Draupadi and their dog. It has been attempted from both the Ruinsara valley as well as from the Jamdar Bamak in the Har-ki-doon valley. 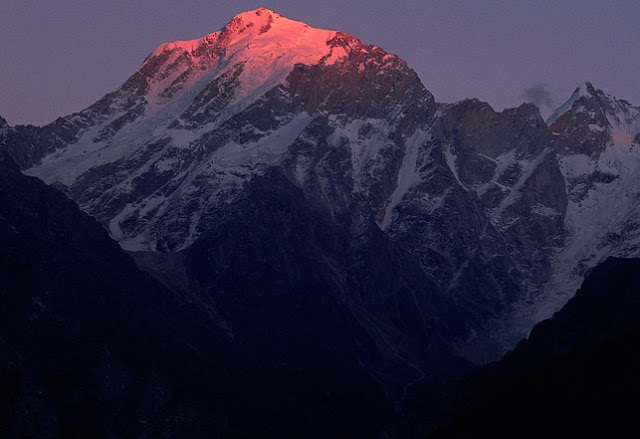 Swaragohini II (6247 M) was first climbed in1974 by and Indo-Canadian team. In 1985 an Indian party made the second ascent and first of Swargarohini III (6209 M). In 1977 Indians climbed Swargarohini IV (5966 M). The first ascent of the main peak was made by the instructors of Nehru Institute of Mountaineering in 1990. They climbed a complicated route to the east col and followed the gentle ridge to the summit. Due to a dangerous cornice they stood about 5 M below the peak. Previously known as White Peak, this southwesterly neighbor of Kala Nag has a long approach of 18km over the Bandarpunch glacier to its summit. It was first climbed in 1984 by an Indian team (Haarish Kapadia) who followed the north East Ridge. The east face that defied Gibson and Tensing Norgay in 1950, remains unclimbed. In 1860, a Khalasi of the survey of India climbed this remote peak. It remained as an altitude record for forty-seven years, as the height was computed to be 23,046 ft. however the modern survey has diminished it to 20,120ft (6,132 M). A beautiful high peak between the Lingti and Chaksachan nalas in Spiti, it defeated an attempt in 1987. Its name means Indian. It is strategically located and can be seen promptly from Tibet. The first ascent for the peak was made in 1989 (Dhiren Pania) by an Indian team from Bombay. The highest peak in Himachal Pradesh remained unknown till the late 1980s. This stupendous rock monolith at the tri-junction of Spiti (Lingti valley), Laddakh (Rupshu) and Tibet (Pare-Chu) offers a long and difficult approach to the base of one of the finest rock-climbing challenges still left. After the early exploration of the routes in 1983 and 1987 (Harish Kapadia), the peak was being approached via Lingti valley when it was possible to cross the river gorge. The attempts by this route in 1996 and 1997 reached high on the mountain and climbed nearby summit. An army team in 1995 claimed an ascent which was disapproved in scrutiny. In 1997 a strong and huge team from SAARC countries attempted the peak from the north (Col H.S. Chauhan). They too misidentified the main peak. Thus Gaya remains unclimbed. This peak rises on the Ratang-Gyundi divide in the western Spiti. It has been only climbed once, in 1956 by Peter Holmes and Rikzen Ladakhi. There are several other peaks on the same ridge and on this valley which awaits climbers. Straddling on the divide between Kinnaur and Spiti this towering peak has a brief history. In 1952 Dr. J.D.V Graaff, in 1994(Harish Kapadia) climbed it. A direct route also has been attempted on this peak in 1988 and 1996. A mountain in other country – such peaks were used as landmarks on the border; here between Spiti and Ladakh. They were also trade posts. On the summit of this peak stands a survey pole (Parang – la Station 1). It is situated at the head of Lingti valley – Yangzi Diwan pass, overlooking the Parang-La trade route. It was climbed in 1987 by an Indian team (Harish Kapadia). The mountain rises at the northeast end of Bara Shigri, sandwiched between the jungles of peaks. It was climbed by two British women and two sherpas in 1961.they reached the saddle between Central peak and it southern neighbor, Lion (6,126m) and then climbed both peaks. Theses peaks have had repeated ascent thereafter. Every range in the Himalaya has its own Kailash. This one in Chamba is the most formidable challenge by its southern approaches. It rises above the Manimahesh Lake and Chobu pass. the first ascent was made in 1968 by an Indo-Japanese team by the easier northern approach. A prominent peak on the watershed dividing the Tos and the Brara Shigri glaciers in Lahaul, Papsura is the peak of evil. To its southeast is Dharmsura which is the peak of Good. Papsura was first climbed in 1976 by a British team which came over the Malana glacier, crossed the pass of the Animals and the Papsura glacier to climb the western couloir of the south face to the summit, despite an accident to the first summit team. Several expeditions have confused Dharmsura with Papsura. Dharmsura (previously known as White Sail) was first climbed by a British expedition in 1941. A fine, inviting peak above the road to Keylong, first climbed by Gen C. G. Bruce. It has a group of various summits and only a few of these have been climbed or attempted. One of the summits was climbed by Indian Army team in 1997. Bandarpoonch West and SwaragRohini are in Garhwal Himalayas (Uttarakhand) and not in Himachal Pradesh.